Rural Revolution: A squagillion thanks!! It has been AN UNBELIEVABLE DAY and I owe it all to you folks!! 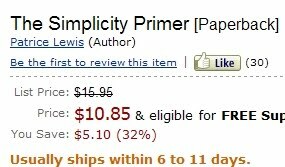 And if this phrasing is anything to go by -- "usually ships within 6 to 11 days" -- that means they SOLD OUT!!! I am stunned, flabbergasted, dumbfounded, and any similar adjective you'd care to insert. I know the ratings will drop since most people bought the book today, but for the time being my family and I were over the moon with excitement! And the booksigning at Costco is confirmed. Here's the skinny for those of you who are local: It's the Costco on Sprague Avenue (just past Fancher), this coming Friday June 10, noon til 2 pm. They have 54 books for sale and have set me up right by the book aisle. The folks at Costco sound awfully nice and helpful and said the only thing I need to bring is a pen. I did that telephone interview this afternoon with two delightful radio hosts in Portland, Tennessee and had a lovely time, though I went into it with sweaty palms and beating heart. These women (Zella and Paula) put me at my ease immediately and it was just like having a long-distance chat over tea. What a day. I'm gonna go plant some raspberries and calm down and get this blog off the self-absorbed subject of the book, but not without once again expressing my complete and utter gratitude to ALL OF YOU. Just ordered mine and checked after: you're up to #65!! I ordered my ten copies this morning, and look forward to reading it and giving it as gifts to friends and family. Several years ago I had a book come out which was reviewed by the Sunday PARADE Magazine. It zoomed up the Amazon rankings unbelievably. It has done very well over the years, and I would be delighted to send you a copy (I think you would enjoy the topic immensely) but do not know how to contact you directly. Blessings to you and Mr. It is O.K. that it will take my copy a whilte to get here. I have too much to read already as it is. Congratulations again! Is it weird to be so proud of someone whom you've never met? Got mine in the mail yesterday. Started reading it today at lunch and several of my co-workers are already interested! Uh oh..... I foresee a whole new box of bookplates for you to sign... ;-) Congrats!!! Glad to see all your hard work is paying off so well. I can't wait to meet you Friday! Patrice, this is awesome for you and your family. Congratuations on the success. Maybe now you can get that tractor fixed or replaced. $10.85 for all the knowledge I've gained from you? Pshaw! And I spent how much on college?!? Cheers to you AND Husband of the Boss! My copy will go to our local library when I am through. Hopefully they will be able to put it on their best seller list. By the way, I am considered a "bleeding heart liberal" but I still am a big fan and enjoy your perspective on life. Way to go, Patrice! COngratulations on your success now & in the future ('cause you know more folks are going buy your book!) ! I bought your book last night and am looking forward to reading it. I'm sorry I'll miss the book signing though. I live in MI but was just in Spokane for a wedding last Saturday. I almost had that timed perfectly. Oh well, maybe I'll be in WA again when you're doing a book-signing for your second book. Awww, thanks Dannie. Oddly enough I highly value the the compliments from the "bleeding-heart liberals" (your words, not mine!). I like it when folks can agree to disagree with amity. I placed my order about 8:30 a.m. (Central Time) and before midnight Amazon emailed me that it had been shipped! Woohoo! Alright! I love it when hard work and dedication pays off! Congratulations Patrice, you're an inspiration to many. Wow. Do you have a shipping special with Amazon. I ordered my copy yesterday morning along with a couple more books so I could get free shipping and I just got my copy this afternoon via UPS. That's service. The other stuff is coming later. Excited to get it so soon. Hope everyone gets theirs that fast. Patrice, I ordered the book early yesterday morning (I read my "news" with my coffee before doing chores) and this afternoon when I got home from work there it was on my porch! I used the supersaver free shipping so I didn't ask for it to get here fast but it did! I am looking forward to reading it tonight after the kiddos are in bed. It looks "tasty", I have been flipping through it and can't wait to read it! Congrats Patrice!!!! This is so well deserved and I am so happy for you!! !